Description: This book is an expansion of Dr. Charles Price's classic book The Real Faith, first self-published in 1940. This version includes a section on miracles from his autobiography, And Signs Followed, The Story of Charles S. Price. Dr. Price had one of the most miraculous ministries ever seen. So miraculous, in fact, that some of the miracles he mentions in his book will amaze you because they are so astounding. 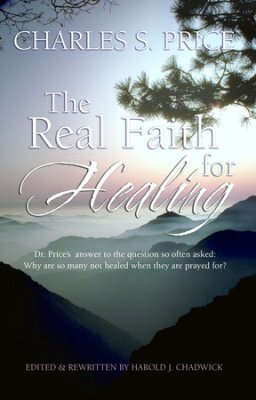 Yet for years Dr. Price was puzzled about something that has probably puzzled you also: Why were some healed and some were not? After a long and agonizing search he was certain he had found the answer, and so he wrote his book, The Real Faith, to share what he had found with those who needed healing but had not been healed. And what he found could be the key to your healing or the healing of a loved one. "Dr. Price's written and spoken ministry had a profound influenece on the direction of my own life. My sister, Florence, had a collision with a truck carrying hot asphalt. She recieved third-degree burns, and her pelvis suffered seven fractures. She was compelled to lie in a bed of salve because her burns were so severe that she could not stand the touch of bedding or clothing. X-rays showed the sharp points of broken bones were headed into vital organs. Because of her burns, she could not be operated on. Charles Price was originally from Britain and trained in law at Wesley College, Oxford. He had a conversion experience at a Free Methodist mission in Spokane, Washington, and later attended Aimee Semple McPherson's meetings in California, where he was filled with the Holy Spirit. From that moment on he became a blazing flame of evangelism and a channel for divine healing wherever he went.